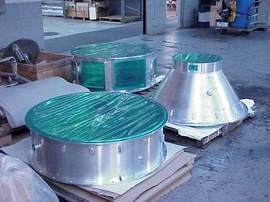 Aluminum Vacuum Chambers: “Hog Outs” versus Welding - Meyer Tool & Mfg. 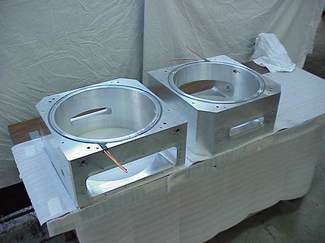 For small to intermediate sized (up to 6 cubic feet) aluminum vacuum chambers, two approaches to fabrication have traditionally been available: machining as one piece from a single large block of aluminum (e.g. 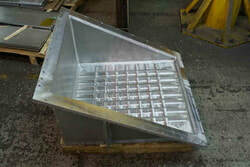 a “hog out”) or welding plates, or forming and welding plates together, to manufacture the chamber. 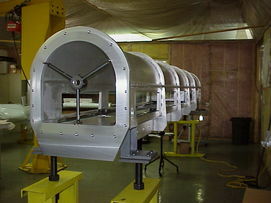 Regardless of approach, fabrication of most chambers will involve both machining and welding operations. Welded chambers require machining for o-ring grooves, ports and other features. Machined chambers will often require some welding to attach ports or to close openings made for machining purposes. Determining the best fabrication method for your chamber is dependent upon a number of interrelated factors and not obvious except in the simplest of configurations. ​Machining relatively large devices from a single block of aluminum is not uncommon. One well-known example is aircraft landing gear assemblies. The 7075 aluminum alloy used in these assemblies does not have favorable welding properties and machining of the assembly, as a single piece, is necessary to obtain the required mechanical strength. The 6000 series aluminum alloys commonly used in vacuum applications are readily available in plates up to 16 inches thick. 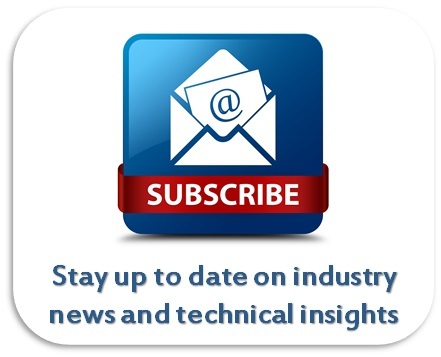 New material possibilities in the form of vacuum quality near net shape castings and forgings are now available. The availability of material coupled with aluminum’s very favorable machining properties makes machining relatively large chambers from a single piece of aluminum a real possibility. Since 6000 series has favorable welding properties, features such as ports can be easily welded to the machined chamber. The reliability of welded aluminum chambers (see “Sealing Options for Aluminum Vacuum Chambers”) as fabricated by companies with experience in aluminum welding has been demonstrated. Achieving leak tight permanent welded joints in aluminum is routine when performed by competent, experienced welders following stringent procedures. Since either fabrication method can meet your first need, a helium leak tight vacuum chamber, what factors will effect your selection of fabrication method? Our contention is that while there are any number of factors contributing to the decision, ultimately only two are paramount: cost and mitigation of risk. 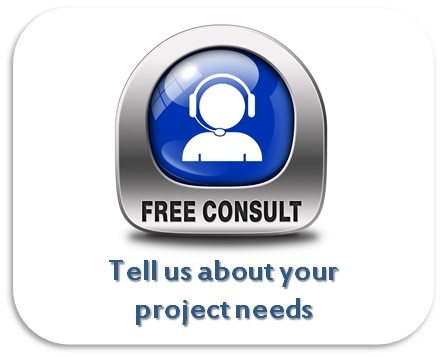 Cost: There are a few factors that significantly affect the cost of fabrication. Choosing the most cost effective process or combination of processes involves reviewing and trading off between these factors. We discuss these factors below. Configuration: Cost effective shapes for hog outs include heavy wall rectilinear, polygon, and cylindrical. Cost effective shapes for weldments include thin wall cylindrical shapes and rectilinear or polygon shapes where inner and outer vessel wall dimensions are not critical. Unlike stainless steel chambers, utilizing welded stiffeners on thinner members is generally not cost effective. If weight reduction is necessary, machining of pockets in the material is utilized. For wall thickness of 0.5” or greater, small rectilinear chambers (less than 0.5 cu ft) and larger intermediate size rectilinear chambers (between 2 and 6 cu ft) plate hog outs will generally be the most cost effective fabrication method. Thin wall (.38” thick or less) cylindrical chambers will almost always be most cost effective when fabricated as weldments. Material: Thick plate stock, forged billets, centrifugally cast or forged cylinders, vacuum compatible cast near net shapes are all more expensive than comparable materials used to fabricate a weldment. The thick plate used in hog outs will be more expensive than the thinner plates used in weldments on a slightly more per dollar per pound basis but also because of the material waste inherent in the process. Forged and centrifugally cast materials tend to be 3 to 4 times as costly on a per pound basis as plate material. Forged billets will also have the same waste factor as large plates, but may be the only available option in larger sizes. Cylindrical shapes in forgings and centrifugally castings waste much less material, but due to the material manufacturing process have limits on near net shape. Thus these forms are best suited for finish wall thickness 0.5 inches or thicker. A limited number of casting vendors provide vacuum quality castings in near net shapes. However there are relatively high one time costs for the casting pattern. Except for the smallest of vessels (less than 0.5 cu ft) material pricing for weldments made from aluminum plate will be less expensive. The further the hog out shape is from finished configuration the greater the advantage to the weldment. Expect to pay more in material costs for hog outs. Cleaning: Hog outs from plate material are the easiest to clean. Generally if the configuration lends itself to being reached by a machine tool, it can also be easily cleaned. The uniform and tight grain structures of centrifugally cast and vacuum quality castings are still more porous than wrought plate material. This makes them more difficult to clean for ultrahigh vacuum applications. Standard methods of cleaning aluminum for ultrahigh vacuum will bring out the silicon in aluminum weld filler metal. This leads to additional cleaning labor on weldments. If the chamber is fabricated from plate or forged material, the labor advantage is to the hog out. Mitigation of Risk: Most of Meyer Tool’s customers use their aluminum vacuum chambers in critical applications. Applications can be considered critical due either to the costs of a downed process line or the inaccessibility of the chamber for in place correction (e.g. you don’t want find a problem with a chamber installed at the South Pole). Thus mitigation of risk, not initial cost, is the most important factor in chamber selection. This fits with Meyer Tool’s belief in providing our customers with the lowest total cost of ownership. In choosing the correct fabrication methods we strive to provide the best fit to give the user the most cost-effective functional chambers. Prototype vs. Production: As stated above, whether building one or many can change the fabrication methods chosen. However the critical nature of some chambers might lead to the selection of methods suitable for production to minimize the variation possible in typical one-off fabrication. One time cost associated with near net shape forgings or castings, while leading to higher cost for a single unit, can result in much more robust fabrication methods. Near net shapes eliminate most if not all the internal stresses relieved in the machining of hog outs and have none of the internal stresses inherent to weldments. The same is true of the investment in fixuring suitable for production processes, whether for hog outs or weldments. Again a more robust process can be developed and variation eliminated. Thus in some cases the more expensive hog out option might be the wiser choice. ​Tolerances: We often see tolerances, flatness, parallelisms, true positions etc., which are difficult to achieve, whether the chamber is constructed as a hog out or a weldment. Elimination of variation in a process always leads to a better product. Single product weldments tend to lead to more variation due to the vagaries of weld shrinkage and stresses induced by the welding. We are not stating that good tolerances can not be achieved in a weldment. Meyer Tool, after all, specializes and excels in achieving high tolerances in large machined weldments. However the facts are that for most configurations it is easier to meet desired tolerances on hog outs. Temper and Stress Relief: Hog outs will not require retempering due to the heat of welding. Retempering can often lead to unintended distortions and make it difficult to hold tight concentricity, flatness and parallelism tolerances in weldments if proper process controls are not taken. Induced stresses from welding can also be relieved during by thermal stress relieving or through post weld machining. Again if proper process controls are not taken, tolerances can be difficult to achieve. Where tight tolerances are needed, the advantage here is definitely to use hog-outs. Either hog outs or weldments can be cost effective methods of fabrication of aluminum vacuum chambers. Sometimes a combination of methods may be the best choice for fabrication. Material costs for hog outs will be more expensive than for weldments. There must be corresponding savings in labor costs in order for the hog out to be less expensive than the weldment. One time costs for forged or cast materials can make the hog out option less desirable for single units but more cost effective for multiple chambers. Heavier wall non-cylindrical shaped configurations are best suited for hog outs. Thinner wall cylindrical shaped configurations are best suited for weldments. Mitigation of risk can lead to selection of processing methods that involve utilizing robust fixturing for weldments or one time set up charges for hog out materials. Weldments can be post machined to high tolerances, but for most configurations hog outs will be have less variation and make it easier to achieve tight tolerance requirements. Mitigation of risk to ensure tolerance compliance often can make a more expensive hog out the better choice for an application than a weldment.